A couple of weeks ago, I had many of you talking after I posted a note on my Facebook page about enjoying a salad of sprouted lentils. Many of you hadn’t heard of sprouted lentils before and I received many questions about them. I also had people confused, because I do eat a Paleo diet and lentils are not part of that lifestyle. So here’s the scoop on sprouted lentils. First of all, the reason that lentils and other legumes aren’t eaten by myself and other Paleoistas is because they contain phytic acid. Phytic acid binds to nutrients in your foods that prevent you from absorbing those nutrients. If that wasn’t bad enough, cooked lentils are also known to be hard on the digestive system. 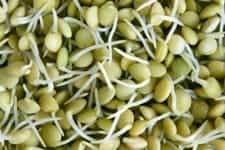 When you sprout lentils, though, you take care of the phytic acid problem and you gain all of the nutritional benefits of lentils along with the huge benefit of eating the living enzymes of a sprout. They’re also completely gentle on the system. You also have the wonderful feeling of eating a living little sprout! Sprouted lentils taste a bit like fresh peas and they have a very satisfying little crunch. They’re great in sandwiches, salads and stir frys. I honestly toss them on everything! How do you sprout lentils? It really could not be any easier. All you need is a handful of dried green organic lentils, some water and a fine mesh sieve. Or you can use a mason jar and some cheesecloth or a fancy sprouting screen. Rinse your lentils and place them in a bowl of water, or in a large mason jar filled with water, topped with cheesecloth and secured with a rubber band or the outer ring of the jar’s lid. Leave them for a few hours, rinse them and give them more fresh water. Let them hang out there until they can get nice and rehydrated, overnight should be good. The next day, rinse the lentils again but this time you won’t add more water. If you’re using the mason jar method, just rest the jar on its side. Rinse them a couple of times a day. The bowl/sieve method is even easier. Just let the lentils sit in the sieve on top of the bowl until they start to spout! Be sure to rinse a couple times a day. After about three days, you’ll have a jar full of beautiful little sprouts! You can harvest them when the sprouts are half an inch long with tiny green leaves starting to form. Store them in the fridge for about a week. Are you on Pinterest? We’re having so much fun! 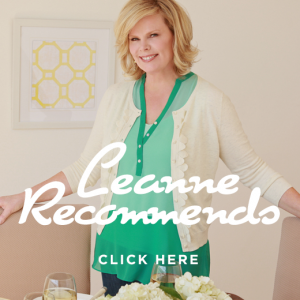 Join us to view our growing collection of recipes, articles and cool ideas for the kitchen!